"...Way back in 1897, August 11, that was a bad, bad night - foggy! It was so thick it looked as if the space between earth and sky ws stuffed with gray-white cotton...."
At low tide, the shipwreck is still visible over 100 years later! 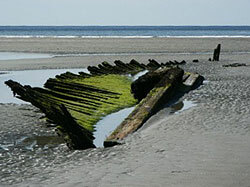 To read all of Emma Bray David's recollection of the 1897 Shipwreck, please click here. Written by Scarborough native Rodney Laughton, Scarborough in the Twentieth Century will give the reader a thorough understanding of how Scarborough has gone from a small town to Maine's fastest growing town.